A marine grade aluminum support structure sized to allow for the maximum possible Feed Extension Tube length to be positioned on an AeroSpreader™ Feed Broadcaster configured with a standard feed outlet hose assembly. The Feed Extension Boom is offered in a range of lengths up to 10 ft (3m) and is used to position and support Feed Extension tubes up to 20 ft (6m) long. The Feed Extension Boom assembly is designed to positon a Feed Extension tube’s inlet as close as possible to the air/feed entrainment manifold outlet so as to avoid any loss of blower energy. Each Feed Extension Boom includes an adjustable slide strut assembly to set boom elevation for optimum feed pellet distance and drop. 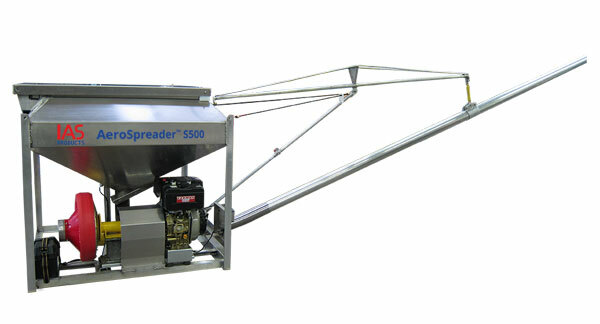 Designed with a feed broadcaster positioned pivot point, the Feed Extension Boom can be turned up to 90-degrees left or right to address best feed pellet drop location. 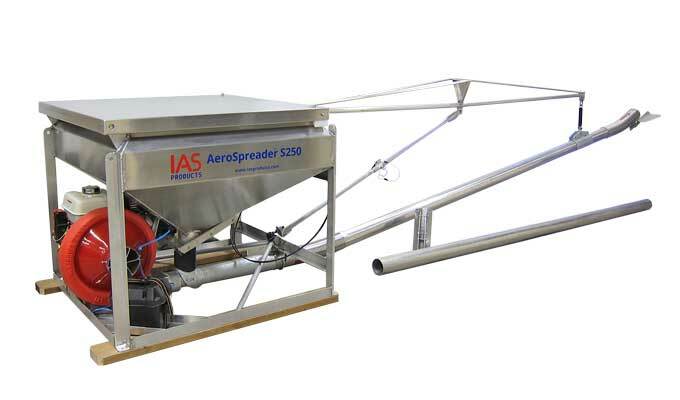 In the case of a truck mounted AeroSpreader™, the Feed Extension Boom can be repositioned parallel to the feed hopper for ease of driving to and from a central feed storage facility. Optimum use of blower energy with the Feed Extension Boom positioned at air/feed entrainment outlet. All aluminum construction insures minimum weight and maximum support of a Feed Extension Tube. Feed Extension Boom supports a range of Feed Extension Tubes designed to offer increases in feed broadcast distances over standard feed broadcast hose assemblies. Feed Extension Boom includes an adjustable slide strut assembly and pivot point to set boom/Feed Extension tube elevation for best feed distance and feed pellet drop placement.